Row 1: Into the circle, 3ch, 1dc, 2ch; *2dc, 2ch* *to* x 5 (6 x 2dc groupings), ss into top of 3ch to close. Row 2: Join yarn in any 2ch sp; 5ch in same sp as join (counts as 1sc, 4ch); *1sc, 4ch into next 2ch sp* *to * x 5; ss into first of 5ch at start to close. Row 5: Join yarn in 1st dc of any 6dc group; 3ch (counts as 1dc) in same dc as join; 1dc into each of next 5dc; 2dc into 1ch space, 2ch, 2dc into next 1ch sp; *1dc into each of next 6dc; 2dc into 1ch space, 2ch, 2dc into next 1ch sp* *to* x 5; ss into top of 3ch at start to close. Row 6: Join yarn in same place as close ss on Row 5; 3ch in same space (counts as 1dc): 1dc into each of next 6dc (7 dc grouping); 3ch dc spike to the left of the dc in Row 4; dc spike to the right of the dc in Row 4 (crossover spike made); 3ch; *skip 2dc; 1dc into top of 3rd dc; 1dc into each of next 6dc (7dc grouping); 3ch dc spike to the left of the dc in Row 4; dc spike to the right of the dc in Row 4 (crossover spike made); 3ch* *to* x5; ss into top of 3ch at start to close. Row 7: Join yarn in 1st dc of any 7dc grouping; 2ch (counts as 1hdc) in same dc as join; 1hdc into each of next 6dc (7 hdc grouping); 3ch, 5dc cluster (refer Note); 3ch; *1hdc into each of next 7dc; 3ch, 5dc cluster (refer Note), 3ch* *to* x 5, ss into top of 2ch at start to close. Row 8: Join yarn in 1st hdc of any 7hdc grouping; 3ch (counts as 1dc), 1dc in same st as join; (1dc into each of next 2 hdc, 2dc into next hdc) x 2 (10dc grouping); 3ch, 5dc cluster (refer Note - working the third dc of the cluster into the top of the cluster in Row 7), 3ch; *2dc into 1st hdc on next 7hdc grouping; (1dc into each of next 2 hdc, 2dc into next hdc) x 2 (10dc grouping); 3ch, 5dc cluster (refer Note - working the third dc of the cluster into the top of the cluster in Row 7) 3ch* *to* x 5, ss into top of 3ch at start to close. Follow steps 1 - 4 five times; and then steps 1 -3 once; joining with a ss into the first ss at start to close. Row 3: Join yarn in space between any 2dc groups; 3ch (counts as 1st trc), 2trc into next space as follows - work the first and second parts of the stitch leaving last loop on your hook, into next space work the first and second part of 1 trc leaving the last loop on your hook (four loops on hook). Yarn over hook and draw through all the loops on your hook to form your cluster; 4ch; (into same space as last trc, work 1st trc of 4trc cluster; into next space work 2nd & 3rd tr of 4trc cluster; into next space work the last st of 4trc cluster, 4ch) x 11 (12 x 4trc clusters made); sl st into top of first cluster to close. Break off yarn. Row 4: Join yarn in 4 ch space between clusters; 3ch (counts as 1dc), 4dc (5dc grouping), 1ch into same space as join; *5dc (5dc grouping), 1ch into next 4ch space* *to* 11 x (12 x groupings); sl st into top of 3ch at start to close. Row 5: Join yarn in 1st dc of any 5dc grouping; 2ch (counts as 1hdc); 1hdc into each of next 4dc; 1hdc into 1ch sp: *1hdc into each of next 5dc, 1hdc into 1ch sp* x 5; sl st into top op 2ch at start to close. Row 6: Join yarn in any sp between 2 hdc; 4ch in same sp as join (counts as 1sc, 3ch); *skip 2sp between hdc; 1sc, 3ch into next sp between hdc* *to* to end sl st into 1st of 4ch at start to close. Row 7: Join yarn in an 3ch sp; 3ch (counts as 1dc), 3dc in same sp as join (4dc grouping); *4dc in next 3ch space (4dc grouping)* *to* to end; sl st into top of 3ch at start to close. Row 8: Join yarn in any sp between 4dc groupings; 5ch in same sp as join (counts as 1sc, 4ch); *1sc, 4ch in next space between 4dc groupings* *to* to end sl st into 1st of 4ch at start to close. Row 9: Join yarn in any 4ch sp, 1ch(counts as 1sc); 4sc into same sp as join; *5sc into next 4ch sp* *to* to end; sl st into 1ch at start to close. I have an unbelievably bad case of Manda-litis. I thought I would be over it by now - but the fever has me firmly in its grip (hooks?)! Are my doodles starting to look like Mandalas - or are my Mandalas starting to look like doodles?? Well, of course, I had to see what would happen if I tried to turn the doodle into a doily! I crocheted quite quickly while catching up on the latest episodes of series I follow (paying more attention to the screen than the crochet). The stitch count is a little off on one of the "petals" - and there are a few adjustments I want to make - but It didn't turn out too bad! I used Raeesah Cotton Soft (100% Cotton) DK with a 5.00mm hook. The 5.00mm is the recommended hook size for this yarn - but I think it looks a bit untidy (my previous projects were done with a 4.00mm hook). Have an awesome crafty weekend! 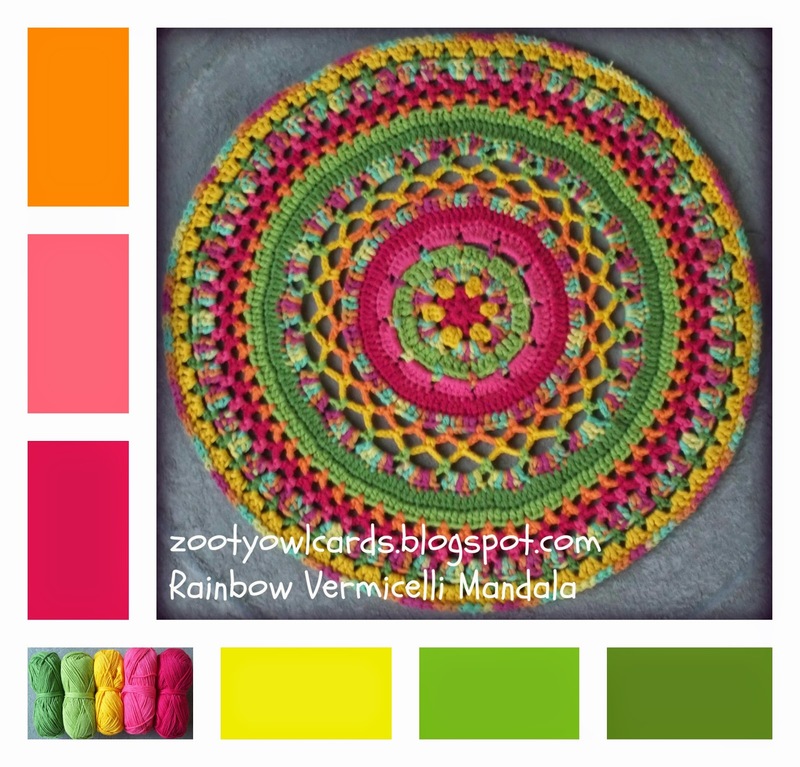 The Rainbow Vermicelli Mandala was designed for a few ladies new to the art of crochet, who wanted to join in the Mandala fun. 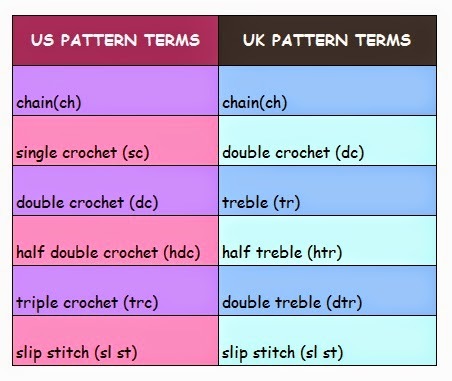 Row 8: Join yarn in any dc; 2ch in same space as join; 1hdc into each dc to end; ss into top of 2ch at start to close. Row 15: Join yarn in space between any 2 hdc, 5ch (counts as 1sc, 4ch) in same space as join; *skip 2 spaces, 1sc in third space between hdc; 4ch* *to* to end, ss into 1st ch of start 5ch to close. Row 18: Join yarn in any 4ch space, 3ch (counts as 1dc), 2dc in same space as join (3dc group) ; *3dc into next 4ch space (3dc group) *to* to end, ss into top of 3ch at start to close. Row 21: ss into any dc; *1ch, 1ss into top of next dc* *to* to end 1ch, ss into ss at start of edging. My mandalas did not really need "blocking", but I did give them a nice puff of steam with the iron (cotton is not quite as well behaved as the acrylics I am used to working with)! Last week Thursday (pre holidays, and pre Starflower Mandala Fever - which you can read about HERE, HERE and HERE) I ordered a stash of lovely Raeesah Cotton Soft (100% Cotton) and a few balls of a pretty variegated Courtelle I wanted to try out. 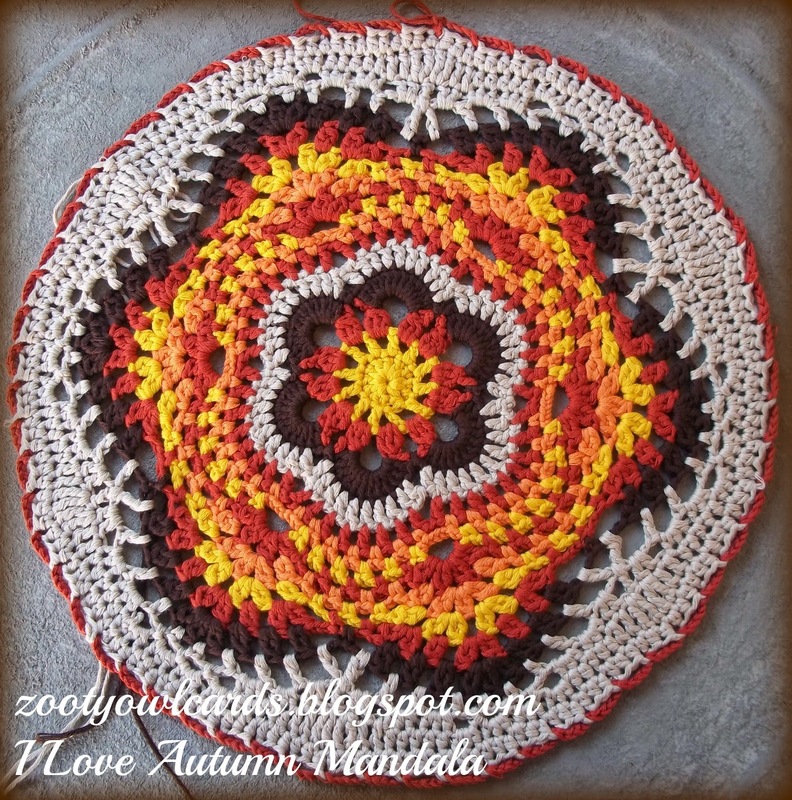 A few ladies new to the art of crochet asked me to create an easy Mandala for them to hook. 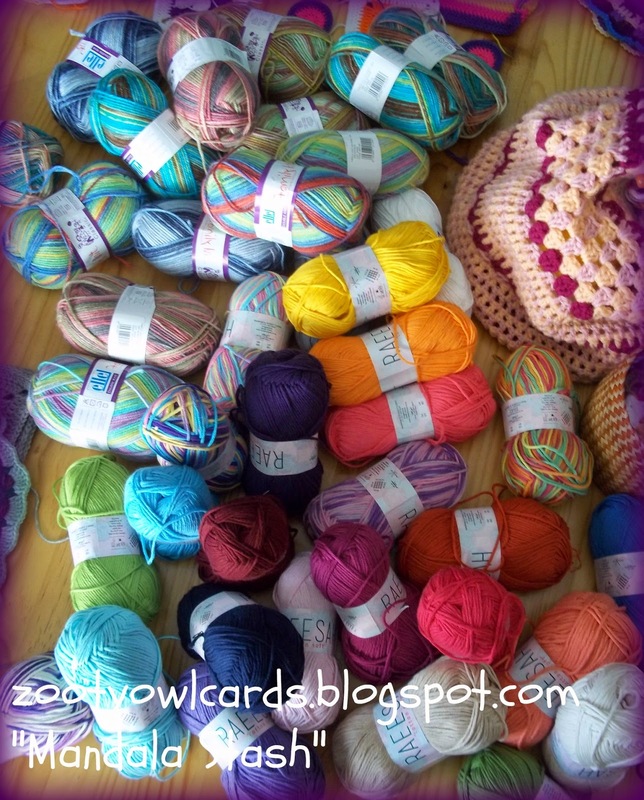 Of course that was the perfect excuse to start a new project using my lovely new stash! I kept the stitchwork very simple so that (a) it would be easy to make and (b) I could use my variegated cottons! I was having so much fun with this - and the variegated yarn reminded me of the Rainbow Vermicelli my children loved sprinkling on cakes and milkshakes when they were younger! 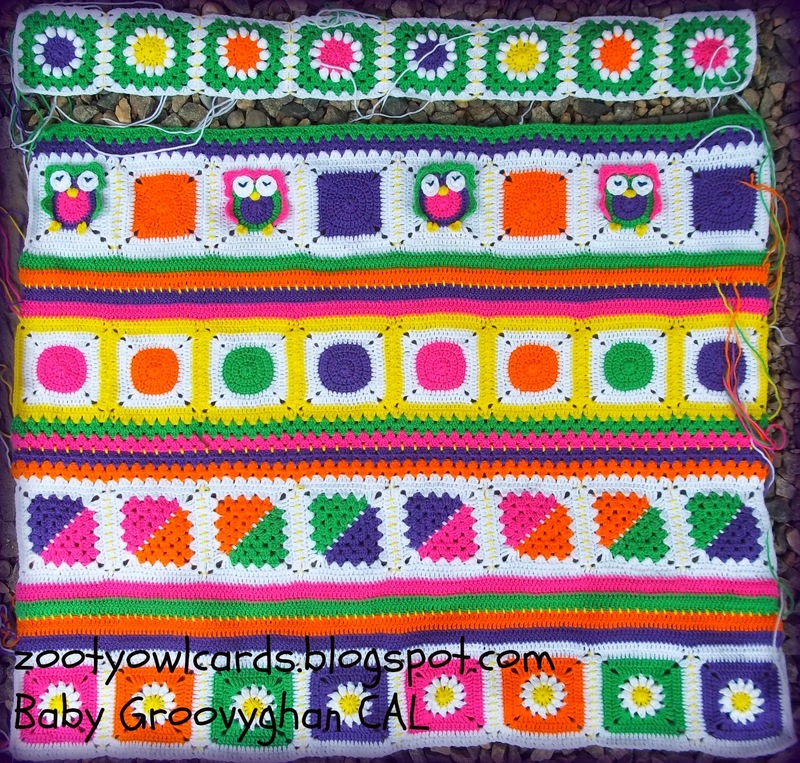 A few more rows and it was done! This time actually writing the pattern as I did each row! (A first for me as I usually get so carried away with the crocheting that I forget to write the pattern down). Four lovely ladies are testing the pattern with me at the moment - a bit slow going, as the ladies have to squeeze in a few rows between children, husband and home. 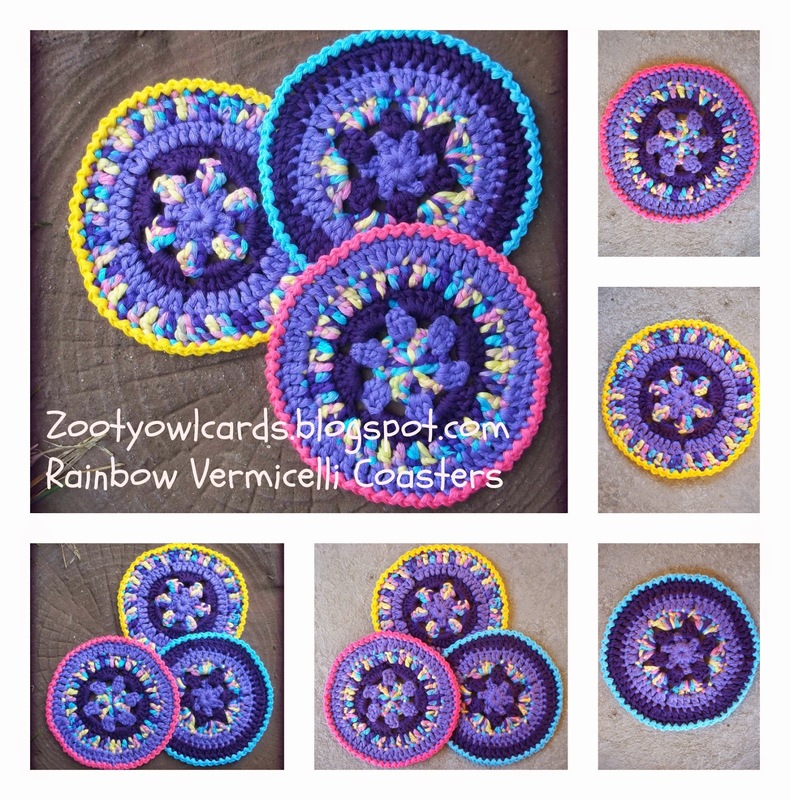 I plan to use this Mandala on the patio and a few matching coasters seemed like a good idea! They do look a bit wonky in the photo - but a quick puff of steam from the iron will sort that out in no time! 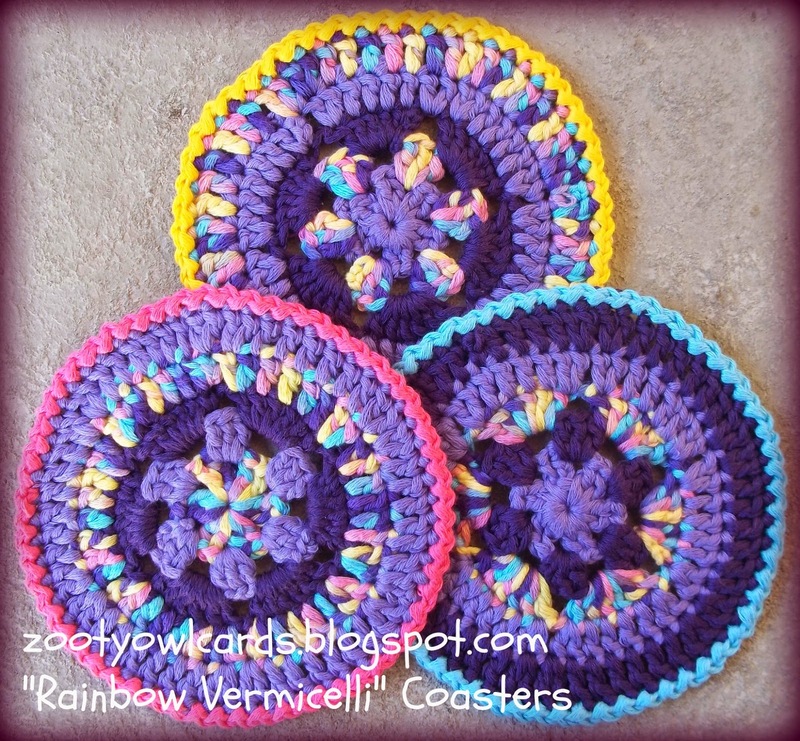 6 Quick and easy rows, work up to a coaster 12cm in diameter. Row 6 ss into any dc; *1ch, 1ss into top of next dc* *to* to end 1ch, ss into ss at start of edging. 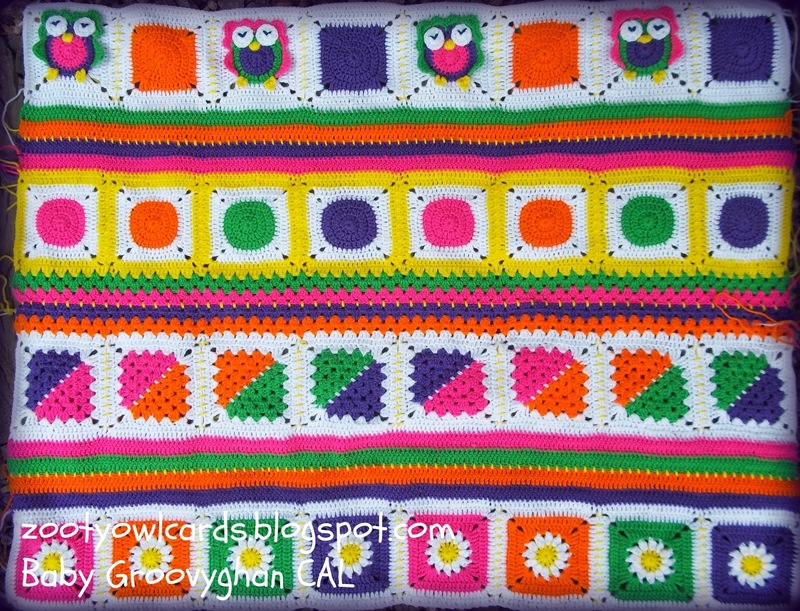 A little bit of quick, colourful hooking fun - perfect for using up yarn scraps! 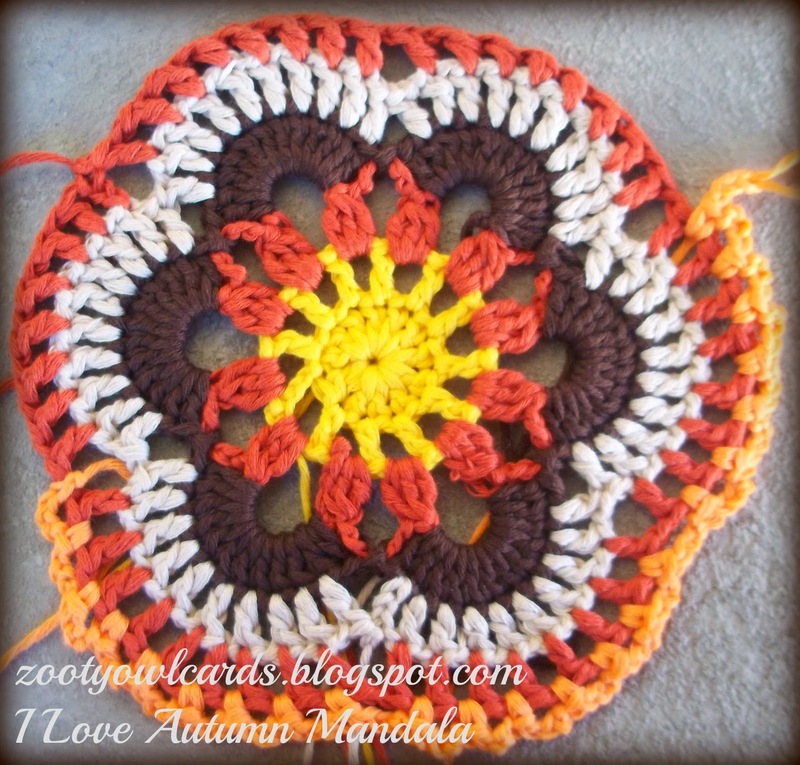 With all the holidays and the excitement about my STARFLOWER MANDALA PATTERN I almost forgot to write this post! Row 1: Join your white yarn (or whatever colour you are using as your border colour) into the corner 3ch of the first square in the row; 1dc into the top of each dc, when you reach a corner on a block 1dc into corner, 1dc into loop of join, 1dc into corner on next block. Repeat this to the end of the row of blocks. 1dc into the last corner 3ch. Next week we do the final stripes and blocks, and the week after (the final week) we will do the border. Happy, amazed, dazed confused!! 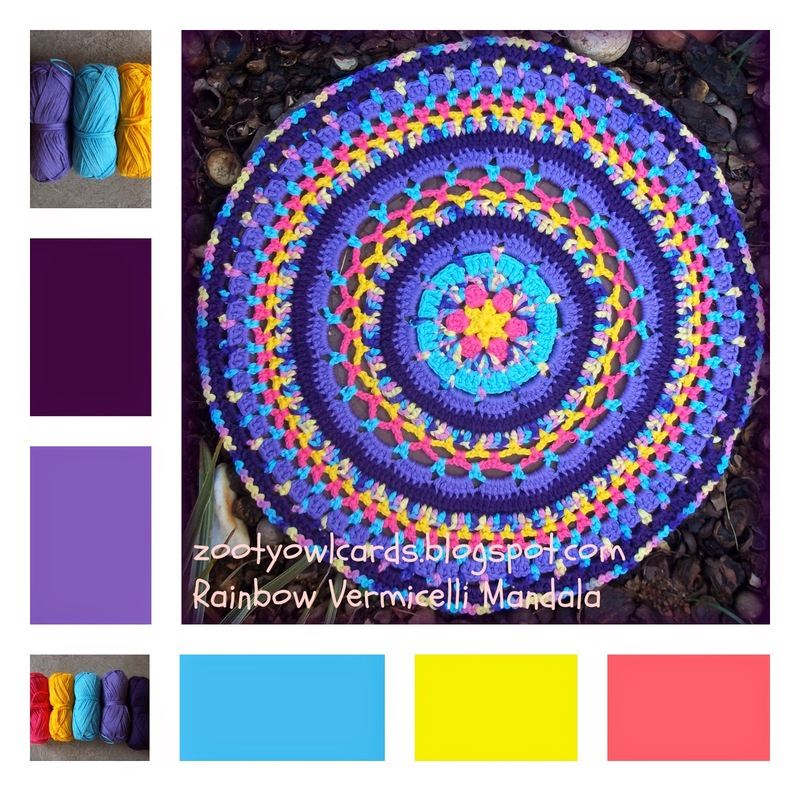 27 000 views on my pattern since I published my STARFLOWER MANDALA PATTERN on Friday! Who would have thought that my "little" mandala would get so much attention?! YAY! 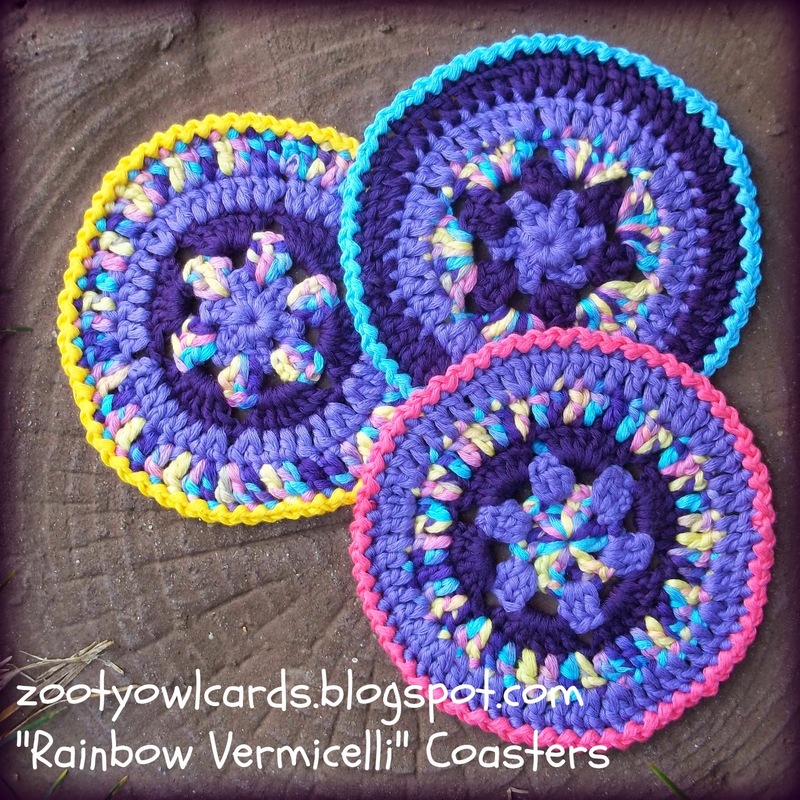 - Thank you wonderful crochet friends!